The original “Buffy the Vampire Slayer” video game was made for the Xbox and Game Boy Color and is a third-person game in which players become the slayer and fight the demons and vampires who, yes, threaten to destroy the world. Within the game, the player will have help from TV-show characters including Willow, Xander, Giles, Angel, and Cordelia. The Master and Spike makes appearances as enemies as well — along with Drusilla. Most of the characters’ voices are by the original actors and actresses on the show. The game also features familiar scenes including the Sunnydale High school, the bronze, the city cemetery, and, of course, the library. All locations have highly-detailed graphics, and the game as a whole features an intelligent fighting-system. A later game, “Chaos Bleeds” — made for the PlayStation 2, Xbox, and Nintendo GameCube — has a plot in which the slayer and Scoobies make war on The First (the Big Bad from Season 7). Characters can use more than 100 various fighting moves, and various mystical weapons are included. The game also has multiplayer ability for up to six people. This is another game, “Wrath of the Darkhul King,” for the GameBoy Advance. Details will be forthcoming! 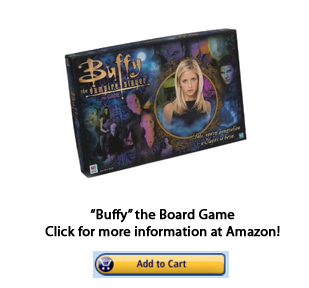 Or, perhaps you’re looking for a different “Buffy” game: the “Buffy” board game, “Buffy” card games, or even the “Buffy” Ouija board! In the board game, players roll the dice to fight monsters, or they can choose to cast magic spells. All of the locations and characters from the television program make an appearance, and the playing piece is made out of pewter. The Ouiji board features comic panels and a pressed board — but be careful not to call-up anything that you won’t be able to slay!